You seniors (and beginners) have it made these days! The technology today makes it ten times easier to pick up this game then it did even ten years ago. If my grandfather could blog, he'd tell you. Unfortunately, my grandfather thinks a blog is a swamp. When I told him I was blogging once, he asked me, "Did you catch anything?" This is the same guy that walked miles and miles to school barefoot in the snow. "Uphill both ways!" he'd always say. Gramps would say about his first set of clubs, "Back when I was learning to play, we had a clubhead the size of a spoon on the end of a tree branch, and we used a rock for a golf ball." He might be exaggerating a little, but to his point, I love these A3OS hybrids for anybody picking up or struggling with their golf game. The hybrids have what they call Boxer Hybrids. These hybrids have the highest MOI then any hybrid I've seen. The boxer shape allows them to move a tremendous amount of weight to the back and perimeter of the clubhead, making them extremely forgiving. This set has everything you need -- including a bag and a putter. 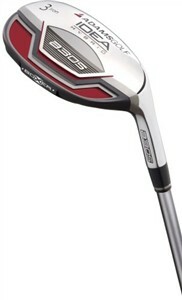 Although, as you improve, I would recommend that you buy a nicer bag and upgrade your putter to an Odyssey Putter. Of course, my grandfather... well, he used to putt with a broken broomstick.